Tim Knoll digicam edit from tim knoll on Vimeo. Will and the boys from Verde came through town not too long ago filming for their upcoming video. He sent me this clip to share with all of you. Of course it's been up on his Vimeo for over 6 hours but that's besides the point. I'm gonna post it anyway. You won't see much Hawaii but it gives you a little taste of whats coming from the Verde team. Verde BMX Team Edit - Spring 2010 from Verde Bikes on Vimeo. May is turning out to be pretty good for some of our guys in Hawaii. Brandon Fugett turned 21 and got to drink his first legal at Hooters at 12:01am. For those that aren't in the know, that's him in the middle. A couple of hours later we start getting emails about his picture being in Dig BMX #76. Rob Dolecki was in town a while back and liked what we were doing so showed us some love. Plus he caught an excellent shot of Brandon doing a lookback fakie. Nice. Marty finally got in the first portion of his electric bikes and is just about ready to start riding them all over Waikiki. And whatever you might say about him, Jimbo just met the woman of his dreams . 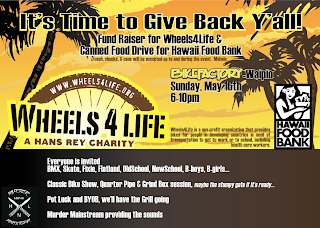 . .
Wheels4Life & Hawaii Food Bank? We're proud to announce that we're hosting a dual charity event at BIKEFACTORY Waipio next Sunday night (May 16th) from about 6:00pm. Come down and show some support for others. 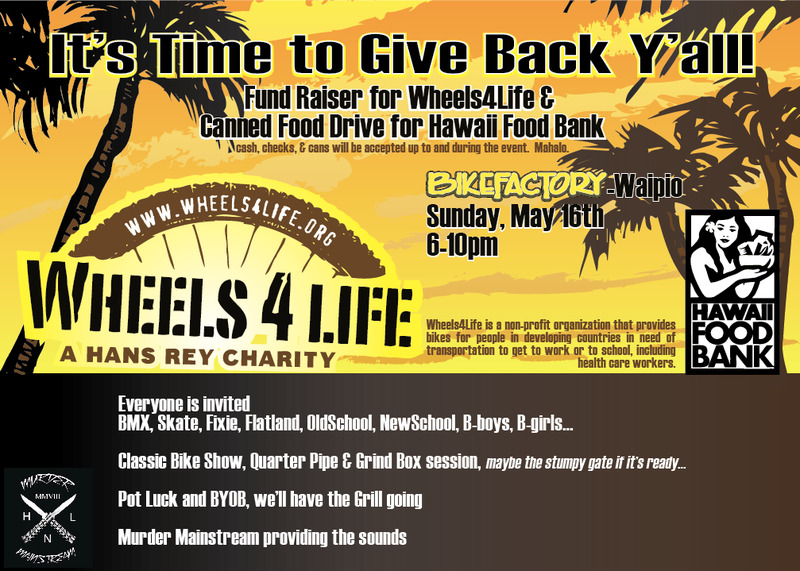 We're collecting Cash, checks and canned food items for Hans Reys Wheels4Life and the Hawaiian Food Bank. We'll have the grindbox, the quarter, and the brand new "Stumpy" Gate. We'll also have the cats from Murder Mainstream holding down the sounds. 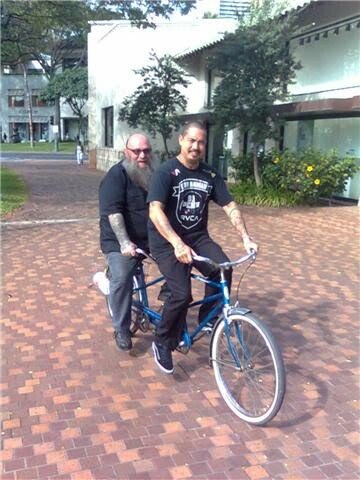 We're also trying to set up an Old-School bike show. Everyones invited so don't be shy. Come on out and have some fun!! Bring your bikes and some potluck style dishes for the grill. BYOB if you're over 21! Let me know or the guys at SHOOTSBRAH.com if you have any questions. And please . . . invite your friends.